Set in Sir Christopher Wren’s beautifully designed Royal Hospital Chelsea at Wren House, the unique venue is inspired by classic elegance and modern luxury. 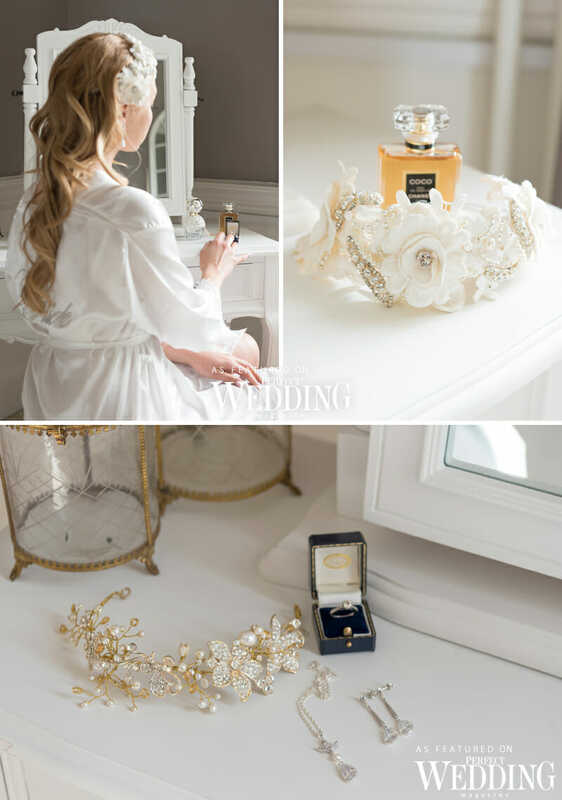 Chelle Belle Makeup Artistry created something every romantic and modern bride can relate to, her very own romantic royal wedding to her own prince charming. Victoria Murray Photography beautifully captures the personal and intimate moments of the bride in her bridal suite as she gets ready before walking down the aisle, reading a handwritten love note from her soon to be husband describing to her of his everlasting love for her. Headpiece above: The Pollyanna, delicate handmade ceramic roses in blush tones with freshwater pearl sprigs to create a soft romantic piece. To finish off the look the satin court shoes ‘Darling’ with embellished heels by Freya Rose. Above: The beautiful light organza Pronovias gown ‘Dinara’ is a romantic modern classic with strapless bodice, delicate beading and full skirt with pleats from the waistline is perfectly flattering. (all the gowns available at Mirror Mirror Couture). Second look above: Transforming into a modern princess, the Pronovias ‘Doresa’ gown is a stunning ball gown with boned sweetheart bodice creating the ultimate romantic bride look and draped in organdie fine pleats. The detachable ‘off the shoulder caps’ gives the choice of two looks – with the handkerchief styled full-tiered skirt which is luxurious and fun for the modern bride. 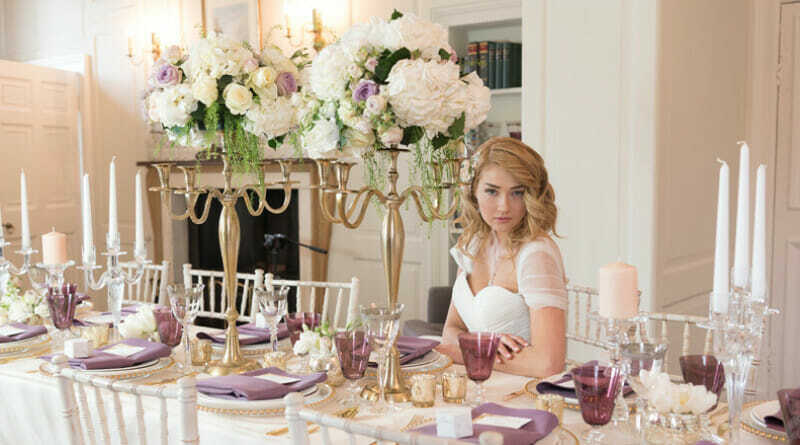 Beautifully styled by Davina Simon Weddings using the elegance of the colour white and current colour trends in pastel shades and gold touches for luxury. Davina says “I put together a design based on Sychelle’s elegant concept, I then thought through each detail from the Stationery, Cakes and how guests would interact during their dining experience. Layering and texture are important to ensure guests have a sensory experience”. An abundance of White Tulips and Avalanche Roses placed along the grand table gives a feeling of spring. Fresh floral decor in different textures in the large Hydrangea and Rose arrangements carried through to the statement Cascading table arrangement at the end of the table. The design of this inspiration incorporates the classic pieces already in the venue. Luxury, bespoke handwritten modern calligraphy on parchment paper with deckled edges and embellished with gold leaf foil were held together with ribbon to tie in modern luxury and romance theme and placed into each carefully folded Napkin topped with a marble and gold geo favours against the twinkling candles. We love the romantic atmosphere of the tea lights and glass Candelabra’s. Third bridal look above: A satin fitted gown by Atelier Pronovias ‘Rafia’ is ‘Luxe goddess glamour’ at its finest. The front is a modest but striking clean and slinky mermaid style, which plunges into a deep V at the back giving drama with the stunning diamante crystal embellishment that enhances the back. 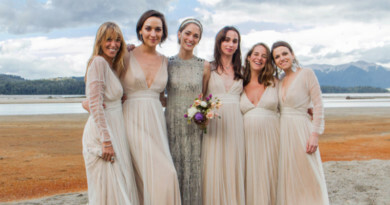 Our bride-to-be is ready for her prince with three very beautiful looks throughout the day. Headpiece: the J-Rose with gold and freshwater pearl, which come together in this beautiful vine oozing glamour and sparkle. With stunning gardens overlooking the Thames, Royal Hospital Chelsea London‘s Grade heritage site was the ideal venue for a romantic, ‘classic meets modern’ elegant, intimate wedding style shoot.